In fact, other than the darkness of that solitary confinement area, Hostel Celica, in Ljubljana, Slovenia, is anything but creepy. It is perhaps the most vibrant and energetic hostel I’ve ever rested my head. Hostel Celica isn’t just a budget accommodation option in Ljubljana (and as far as budget goes, it isn’t as budget as other spots in town). It’s a restaurant. It’s a shisha lounge. It’s a place to be free, the exact opposite if what it was originally built for in 1882 when it served as a Austro-Hungarian military prison until 1991 — when Slovenia became independent from Yugoslavia. In 2003, the building underwent a massive renovation which brought together city authorities, the Student Organization of Ljubljana and the Metelkova art movement to make a total of 80 international artists to create the charm and art that became Hostel Celica. 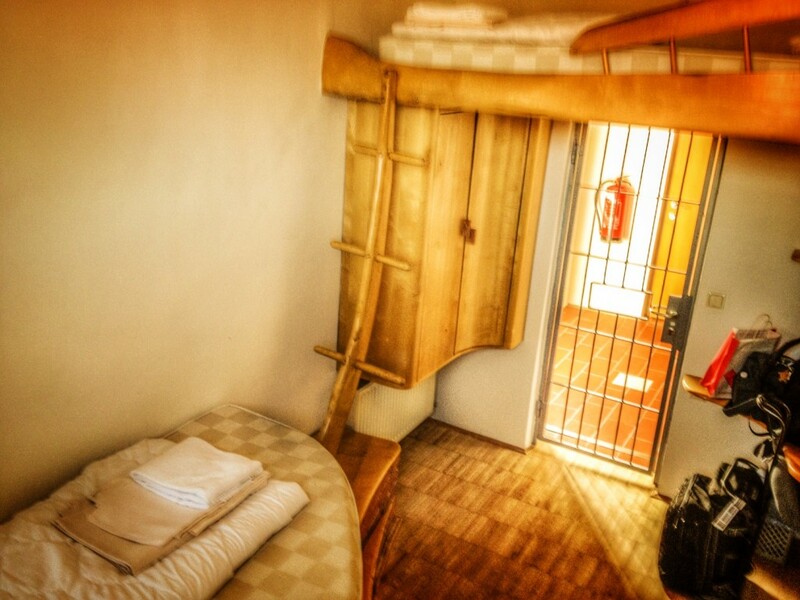 This hostel, which offers private rooms in former prison cells, complete with the original metal-bar doors, as well as dorms, has been entirely recreated from its oppressive roots. What used to stifle freedom as a military prison, today it pushes and pulses freedom through it’s every facet. The rotating art exhibits it houses; the live music it welcomes; the locals who flock there before a night out at the squatter-turned-hip-turned-hangout-turned-attraction, Metelkova, behind the building. As a visitor, I feel it immediately when I step through the graffiti-covered area surrounding the building: Hostel Celica and its surroundings are alive. Thriving. Pulsing. Colorful and intoxicating. The tendrils of creativity, of calm and excitement at the same time reach me the moment I arrive. Of course, I don’t. But, I cling to that Slovenian ambiance enveloping me as we push closer to the capital. When I arrive to Hostel Celica and am greeted by friendly staff and just an overall air of happy, I welcome the idea of getting out of the funk I put on myself earlier, en route to this city I have dreamed of visiting for so long. The woman at reception is friendly, telling me all about the hostel, the restaurant it houses, the events each night of the week, and the best part — the event tonight — the launch of a new photography exhibition plus live music — before I head upstairs to my personal prison cell (with no irony whatsoever in that statement). My room is one of 20 on this floor, all designed by renowned artists. It is simple and yet so different from any other place I’ve stayed. Perhaps it is the half-round bed, or the cell windows, or the fact that I have no bathroom, even though, for half-a-second when I walk in, I search for a hidden door to lead me to my private bathroom I imagine a private room would have. But, nope, its down the hall and spotlessly clean. The only room on the floor that is sans bars is the former cell dubbed the “Point of Peace,” an area where guests can take a moment and get back to their own thoughts. The room offers six niches, which represent different world religions, plus one niche left empty to welcome any other religion. When I am there, I see no one in the room, but I can feel the tranquility when I walk by. The floor above the private rooms houses dorms and a kitchen and laundry room. (Note: laundry is pretty pricey at 7 euros a load to wash and dry.) Like the private cells, the dorms which offer various numbers of beds from four to 12, also incorporate art into the design. 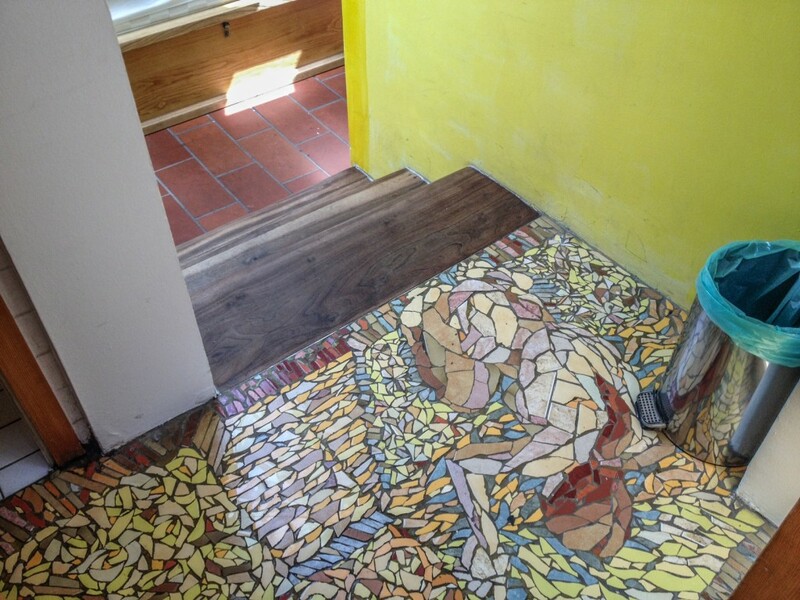 Each has colorful mosaics in the entry way and handmade beds. The only downside I found to both the private rooms and the dorms is the lack of wifi. When I question why the hostel doesn’t have it, I learn that the prison walls are quite thick and therefore it makes it extremely difficult to transmit a signal. Therefore, the only place with wifi is on the first floor in the common areas. It’s actually a nice break for me to not have the wifi … it forces me to write, to mingle, to not lock myself in the room and get lost on the internet instead of lost in the city. I wasn’t planning on staying at Hostel Celica for the entire time I was in Slovenia. Hell, I wasn’t even sure if I was going to stay in Ljubljana during the stretch of time I had before meeting my mom in Venice. But, on my second day, after exploring the gorgeous city and returning to the hostel, I decided it was the perfect spot to just chill. So, what was meant to be two nights ended up turning into seven. Within two days, I felt at home in the hostel. The staff at the bar all knew me (I swear, I wasn’t drinking all of the time), and were always nice, taking the time to joke and chat. While the end of May technically is shoulder season, during the week the hostel was quite quiet. But, there was still something going on every night, whether it was the photo exhibition, live music, mustache party, BBQ or other event, there was always something happening. I took comfort that even though I was alone in Ljubljana (for the most part) I could walk downstairs to the restaurant, the bar, the large outdoor patio, and meet other travelers and locals, which is a huge selling point for me. Hostel Celica stole my heart. As I have changed the way I travel, hostels tend to not really do it for me much anymore. I prefer local haunts which offer a chance to mingle with travelers as well as natives. However, this hostel does that and so much more. I love how much culture is evident in every inch of the building, how the people who work there care, how the people who visit there are interested in what is has to offer. I wasn’t a huge fan of the buffet breakfast, largely because the vegetarian options were quite limited, and at first the lack of wifi in the rooms was a turn-off. However, the value, the location (under 10 minutes to get to the city center and about the same to get to both the bus and train station) and the atmosphere of Hostel Celica make it a fantastic option for lodging in Ljubljana. Editor’s Note: I was a guest of Hostel Celica and Visit Ljubljana for a portion of my week in Slovenia, however all opinions are my own. If you have questions regarding this, please read my disclosure policy. I’ve never wanted to go to Slovenia until I read this post. AWESOME hostel! I love staying in quirky and unique places like this. Alex, just wait!! I have so much more coming about Slovenia. The country was such an incredible experience. I could have stayed there my entire month in Europe. In. Love. Haha. YES. Exactly. It was so cool! Wow, they did a great job turning a prison into a hostel. The rooms look so warm and bright, and we love the hardwood floors! If we ever make it to Slovenia (we’re sure we will) we would love to check it out! Very cool. It really came out so, so cool! I loved it there. It was one of the only places that when I left, I kind of felt like I was leaving a “home” versus just a place I stayed. I was really comfortable there! I stayed here! Really enjoyed the atmosphere, too, much to my surprise. And I met a super fun Aussie at the bar and we explored Lake Bled together. I can’t wait to read more about your time in Slovenia! The prison and the resultant lack of wifi is ironic – a jail that keeps the distractions out. I like it! Isn’t it? I liked it, too! It is a super cool place! Yay! 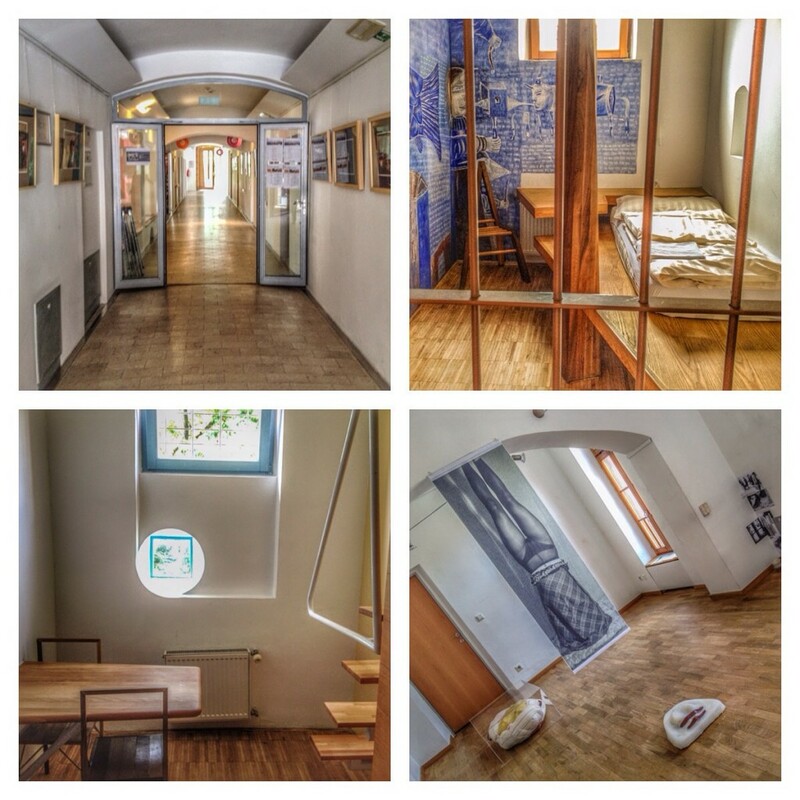 I also visited Hostel Celica last month and it was super cool – definitely a highlight of my trip to Ljubljana. YAY!! We were like to ships crossing in the night. I SO wish I could have hung out with you in Ljubljana. Hostel Celica is the best! The hostel was SO amazing!! I hope you are able to make it there! 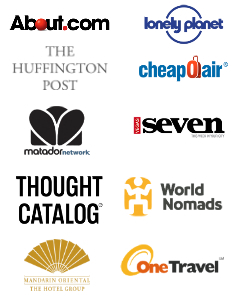 Are you not in Chiang Mai? Living in Lampang for awhile, looking for things to do and see in Chiang Mai…especially ENP ! Sabina, Hostel Celica is right up there with one of the best hostels in terms of character I have ever stayed at! It is just a really, really cool place. Plus, Ljubljana itself is a magical, fairytale city! Aren’t they beautiful? Ljubljana is definitely worth a visit. I hope you make it there! Loved reading about your experience. Ive been considering thi hostel for awhile in planning a trip. This might be a silly question but are the private rooms truly private? Meaning, do you have open bars to the hallway, or do you have a door that shuts you off completely with privacy? Hi, it is a private room 🙂 There are bars, but also a door. The bathroom is shared.